The town of Jacksonville was entered into the National Registry of Historical landmark places about 20 or more years ago and this is only as I remember when we first saw all the new signs that went up everywhere from the exit off-ramp to the Old Stage Road Hwy having a few miles the proud part of this area to be apart of history official. These 32 acres contain some of the oldest pioneer gravesites in Southern Oregon. The original acreage, part of Colonel J.N.T. Miller's government land grant, was platted in 1859 and dedicated in 1860. The Sexton's Tool House was built by John Hockenjos in 1878. 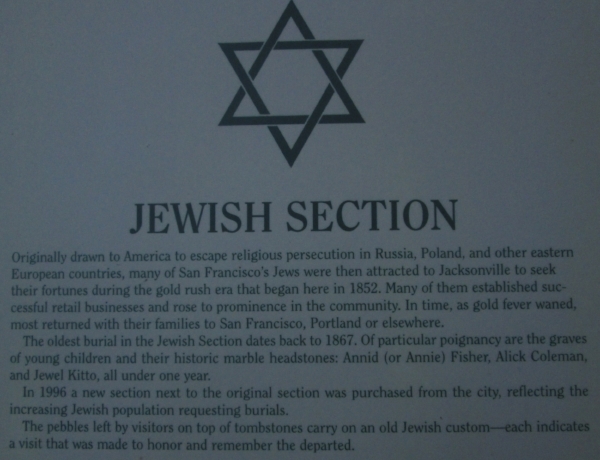 The cemetery is divided into 7 sections, six of which represent the religious or fraternal organizations: Ancient Free and Accepted Masons, Catholic, Independent Order of the Odd Fellows, Independent (German) Order, and Improved Order of Red Men, and Jewish. The 7th and largest section are the City of Jacksonville's portion, which included's a Potter's Field. The gravestones chronicle the Indian Wars, epidemics, and untimely deaths. Some have elaborate memorials in keeping Victorian traditions, while others are simple wooden crosses or markers. Epiraps range from touching to humorous to religious. This is where they sometimes buried the bodies under the house or shed because the ground was frozen or they had to wait. Creepy! As with all historic cemeteries burials were dug by hand and bodies were transported in a wagon drawn by horses or oxen. The burial of the dead was an arduous task both because of the grief, but because of the physical labor required. The location of plots and the documentation for them is as accurate as history and our good intentions. You can actually search for graves that are settlers that came out to the west here in Oregon for the gold rush in the 1830's and it's said that most of them died from diseases that were a problem back then. Purchased by the city on December 16, 1865, this is the largest section of the cemetery. It contains the graves of son and father Anderville, (1831-1852) and Gabriel Plymale (1804-1853), which were the deaths of the earliest recorded in Jacksonville. Typhoid victims, that were originally buried at the bottom of the cemetery hill. And re-interred in this section at a later date. Others buried in this section include Peter Britt (1819-1905), well-known Swiss-born photographer, painter, and horticulturalists, and P.P. Prim (1822-1899), an Associate Justice of Oregon's first Supreme Court. At one time William Bybee (1830-1908), was the largest landholder in the Rogue River Valley. Brilliant writer and journalist, William Green T'Vault (1811-1897), started the Oregon Spectator, Oregon's first newspaper. Also buried here is Reverend Moses A. Williams (1811-1897), who established Jacksonville's Presbyterian Church in (1811-1897), While Superintendent of Schools, he divided the country into its initial school districts. The Potter's (for pauper's) Field is also part of the city section. It contains 133 graves of those who were poor, who were members of Jacksonville's Native American Indian, Chinese, Hawaiian, and black minorities, or who did not belong in any other section. There are no elaborate headstones in Potter's Field and some graves have no markings. Jacksonville formally honored this nearly forgotten portion of the cemetery with a marker in 1996. Before I go any further, but first let me tell you what happened as I was writing this story. I couldn't find my camera with the micro card with the pictures on it. I looked everywhere! Sitting on its edge, upright in front of my coffee pot on the corner just cleaned, was it? Weird, very weird! I have to tell you a ghost or spirit story about my own experience with a spirit that woke me up one night with a touch that I felt on my hand. My feeling it was my sister but I wasn't sure and I was afraid to turn around. Now if you ever experienced the presence of the ora or intense feeling that is unbelievably weird with no way to really explain how it feels. I was wondering why would she come to me we never were close or liked each other and a spiritual guy that is involved with these kinds of things told me it wasn't her but probably something trying to get at me that wasn't a good spirit but evil in a way. Crazy huh? I swear it happened! Here's some of the posts that tells you about the cemetery's history. It was easier to take images of post them which is actually the most accurate information I'd come across. On the internet there's not much about the history as well as these are explained by the words of the historical society. In 1850, the German members of the Improved Order of Red Men, a patriotic fraternal organization with ties to the Sons Of Liberty, seceded and formed the Independent Order of the Red Men. Begun in Maryland like its predecessor and introduced throughout the United States, this organization at one time boasted a membership exceeding 12,000. All business was conducted in the German language. The fraternity, now defunct was dedicated to love of country, to the advancement of patriotism, and to the maintenance to the liberty. Jacksonville was formed in 1870. Henry Wendt (1846-1916). He saw Jacksonville's rural land having acquired the necessary land, which became the town's first "milk Merchant"
Formed in Maryland in May 1835, this fraternal society claims to be the oldest secret order founded in America, with roots going back to the Sons of Liberty. Associated with the Boston Tea Party, the society's patriotic members worked underground for freedom and liberty in the early colonies. Although the members, called Palefaces, were not Indians, they adopted Native American customs and terminology, which today in the organization's rituals. Jacksonville's Tribe No. 1 Red Men, which claimed as members fifty of the most influential men in the area, purchased their half-acre section of the cemetery for $40 in November of 1872 and added to it in 1881. French-born Emil DeFlohain (1849-1922) lies in this section. He is remembered for his expertise as a wagon and carriage maker mechanic and wheelwright. On his 642-acre ranch, he cared for local paupers, acting at superintendent of Jackson County's poor farm for 20 years. He was also one of the chief printers of rural mail delivery. Some last thoughts and tidbits before I start trying to edit the videos of the entire land with every gravesite on each video I tried to make in the bright blindly sun. I do have a horrible one on YouTube but I won't show how much of a newbie I was and should have never posted it but it's got 100 hits. Now the Japanese people were once buried here but then dug up and buried back in Japan. There's also a pauper section which means the settlers that couldn't afford to buy a plot was given a place to be buried. They are still added more acres on. Last I heard was it was only 27-acres and now its 37-acres with room for much more. It's a history lesson for kids or students but for me, I don't like cemeteries to much. I feel like the paths are not as well maintained for the older grave sites and I would hate to step on someone especially when they are at peace. This baby buck was casually walking by as I was trying to take pictures but I took more of him. He's not afraid because he's too young and hunting season hasn't started yet....LOL!